Pope Benedict XVI’s decision to step down from his office was made soon after his trip to Mexico and Cuba in March 2012, according to a senior communications officer at the Vatican. “What’s interesting is how long ago this decision was made, shortly after the Pope’s trip to Cuba, which was in March of last year,” said Vatican advisor Greg Burke. 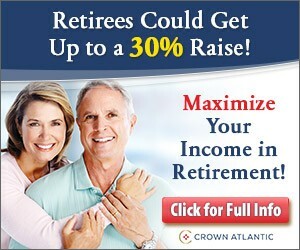 This is what can happen when you visit Hell and meet with the Devil. Again, just to give some historical perspective, the last time this happened, Gutenberg hadn’t yet invented the printing press. What does it mean for the Catholic Church today, with 1.2 billion faithful and the state of the Vatican in the balance? Administratively, not much. But, does Benedict get to keep his Twitter hnadle, @Pontifex? Evo Morales nationalises a Spanish electric company. Spanish companies got taken in Cuba, in Venezuela, and in Argentina; now in Bolivia. Ecuador Bank CEO to Challenge Correa for President, Envivo Says, via America’s Forum. Venezuela After Chavez: In the Footsteps of Franco, Ceausescu or Stalin?, (h/t Public Secrets). In Spanish, Bocaranda’s update on Chavez’s condition: the Cuban doctors are finally facing reality and have ceased the radiation treatments. At least 43 Cuban dissidents have been arrested in areas near where Pope Benedict XVI visited last week, dissidents said Tuesday, as the United States urged their immediate release. “We have been able to confirm that 43 opposition members have been detained — 10 women and 33 men — in a crackdown on Monday in the Santiago de Cuba area. All remain under arrest,” said Elizardo Sanchez, head of the outlawed but tolerated Cuban Human Rights and National Reconciliation Commission. One of those sets of questions involves the Church’s role in Cuba in the next several years. The second set of questions involves the future of the papacy. While the Pope exercises selective memory, Cardinal Jaime Ortega’s thriving real estate business goes on as usual. Cuba: The Pope’s shameful trip UPDATE: Did Benedict see Chavez? Yeah, yeah, now the Pope’s given another Mass in Havana’s Revolution Square, right under the Che monument (Che monument soon to get a Galway branch, like a bank). Benedict gave lip service to hope and change. The meeting followed Benedict’s open-air Mass in the same public square where a younger, healthier Castro once delivered official speeches that lasted for hours and frequently railed against the United States. I wouldn’t know about the hand of God. But going by the evidence, one can safely conclude that the Pope sure doesn’t have b*lls. 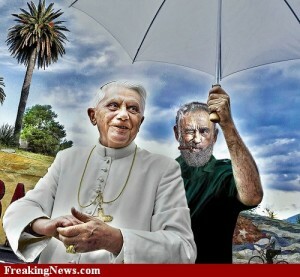 Photo of Fidel & Benedict added. Linked by Nice Deb. Thanks! The alleged meeting, which Bocaranda first reported was in the works on March 25, was arranged by Venezuelan diplomats who used to work at the South American nation’s mission to the Vatican, the journalist said. All participants agreed the brief meeting would be without media coverage, Bocaranda said. Plenty of time to meet the Communists, no time for anyone else.